40+ Style » How to accessorize » How to Wear a Belt – tips and tricks to get the most out of this accessory! How to Wear a Belt – tips and tricks to get the most out of this accessory! A belt is one of the hardest working items in your closet. It’s fashionable and most importantly, accents your curves when worn properly. With so many options available, the most important advice on what belt to choose comes down to what’s most flattering on you. When should you wear a belt? As often as you’d like! A good rule of thumb is to help break up the transition between a loose top and tight bottom (or the opposite), when you want to hide waistline imperfections or when you want to accentuate your waist. Add a belt to define your curves under layers including a top and jacket or cardigan. Gone are the days of matching the belt to the shoes and handbag. In fact, a belt works best when it stands on its own, drawing attention to the waist it cinches so well. Because we’re all different, the most important advice is to try different ways of wearing a belt until you like what you see. If you don’t normally wear belts, they make take some getting used to at first. If you’re comfort minded, start off with a stretchy or elastic belt. And always buy a belt that fits you properly — not too tight or so long that you have to use the last notch in the belt to wear it well. Find the narrowest part of your torso. That’s your waistline and the spot you want to accentuate. Wearing a belt just above the waist line elongates your legs and accents your bust. With a loose or flowy bottomed dress, wearing a belt closer to the ribs also hides small belly flaws. This is one of the trickier looks to pull off since the ribcage expands and contracts, causing a high belt worn too tight to constrict breathing or slip down your torso. A stretchy or fabric belt is more comfortable worn high. Belt loops are helpful to keep the belt in place, or add a bit of double stick tape to the inside of the belt to keep the high belt in place. Just be sure the fabric you’re adhering the tape to isn’t fragile, like some silks can be. With the variety of belts including leather, elastic, woven or a combo of all, as long as you’re conscious of what belt is most flattering on you, wear any style or color. Belts with some elastic are comfortable because they cinch your waist while still managing to move with you. Try different belts with a variety of outfits to find your signature look. The latest trends involve knotting a belt in a unique way, choosing metallics, or wearing a high contrast belt in a complementary color. See a belt as a great accessory to accentuate your shape in ways that other accessories can’t. It’s okay to take risks with bold belts, in the end, whether you wear a belt for fashion or function, you can’t go wrong. Have fun accessorizing — belts create a look that’s one of a kind, just like you. Do you know how to wear a belt correctly? 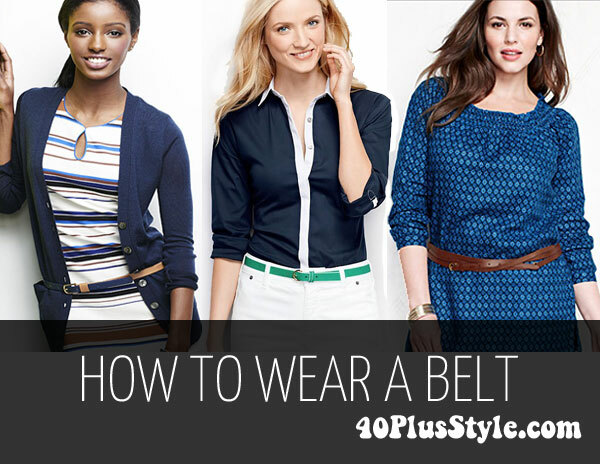 Tell us, what’s your favorite way to wear a belt? Obi belts are comfortable and chic. Anything that can mix those two elements is a winner in my book! Is it odd if I say I don’t own a single belt? And that all the belts which have made appearances on my blog were borrowed? I’ve never felt very comfortable with defining my waist (sorry, Stacy and Clinton) but I must say those worn by Mrs Obama, as well as those high-waisted and obi numbers are quite delicious-looking. I just purchased one so fingers crossed I shan’t commit (too many) fashion sins. It took me a while to add belts to my look, too. I’m sure you’ll look great, it’s all about self-expression, after all– who would have thought that wearing a belt at the ribcage would be fashionable? And yet, Michelle Obama does precisely that and looks fabulous! Hi Cynthia, this is a very helpful post. I think you explained everything very well. Like Sheela Goh I keep forgetting belts. but unlike her, I do own quite a few belts and good ones too. Still, when creating an outfit I keep forgetting them. Or I feel wearing a necklace (which I do almost all the time) and a belt is too much. But most of the time, I just forget. So thanks for reminding me of this great styling item. I haven’t found a belt that looks good on me. I am hourglass (and more full-figured than I used to be) so you would think that it’s easy, but I also have a very short upper body (Seriously, I don’t think I could wear an obi-style belt that is both two inches below my bust AND above my waist — there just isn’t room) and long lower body, and belts emphasize my vertical form. It’s Sylvia’s fault. I used to just look at myself in the mirror and the belt looked good around my waist. But then our New Years’ challenge last year made me decide to take some pictures — and I realized how out of proportion they made me look. Hip level belts would be the vertical solution, but they don’t hit me at my best spot. Yep, I’m a mess. I’m 5’4″ and reasonably well proportioned:) I love (and wear well) the look of a long thin twisted rope belt (with small tassels) wound loosely and knotted around the waist of a knit dress or tunic. Can anyone tell me where to find such a belt? I own a silky black one that came from a Spiegel catalog, but it’s long past its prime. I’ve actually considered converting a set of drapery tie backs, but they tend to be too short. I wanted to say: “Carol, if you find one, give me a shout too”. But then I went through the post again and saw that your type of belts is not for tall, straight people like me haha. You can love something but that doesn’t mean it suits you (in my case). I love belts! My hourglass shape allows me to wear them often they always give my outfit a finishing touch. I love to find vintage leather belts and special embellishments for nighttime. Thanks for your post very informative. Hi Esther, glad to hear you’re on board with belts. They really are a useful and beautiful accessory. Belts are back on my radar. During a closet cleaning frenzy I threw out perfect belt I had stopped wearing. Grrr! How to wear a belt if you have a muffin top waistline? Previous post: How to pack for a 3 month trip?